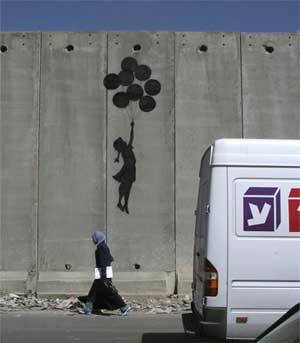 Banksy, a British graffiti artist / prankster who calls himself an "art terrorist," painted these and other images on the separation wall in the West Bank in 2005. He described the wall as "the ultimate activity holiday destination for graffiti writers." Soldier: What the f*** are you doing? Banksy: You'll have to wait until it's finished. Soldier (to colleagues): Safety's off. Old man: You paint the wall, you make it look beautiful. Old man: We don't want it to be beautiful, we hate this wall, go home.